Hopscotch Tiles | Pi'ikea St.
Because I live in the Northwest part of the country, I’m constantly trying to find indoor activities to occupy my kids. The idea of bringing hopscotch indoors has bubbled in my head for a while and I’ve finally got it to materialize. I use a sewing machine to put the tiles together but fabric glue works just as well. 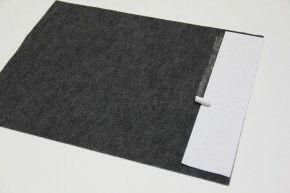 Cut 9 of your felt sheets so that they measure 9”x10”. 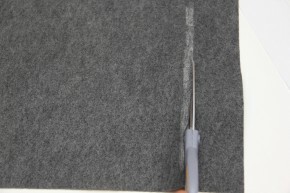 A simple way to do this is to cut a 2” strip of paper. Use it as a stencil and rub chalk (or a marker) along the edge. Then cut and set these tiles aside. 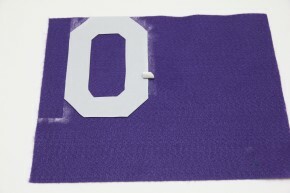 Also reserve one 9”x12” sheet intact for the number 10. 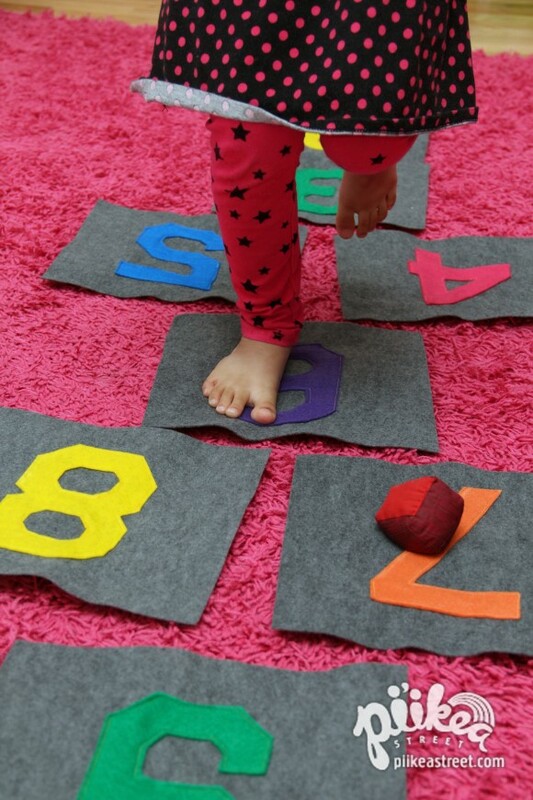 You can draw your numbers on the other felt sheets or use a stencil. I cut some out with paper and used the same chalk method from step 1. Then cut out the numbers. Skip to step 4 if you’re using a sewing machine. Glue a number onto the center of each tile from step 1. Allow to dry then proceed to step 6. Center a number onto each tile from step 1. Then pin in place. 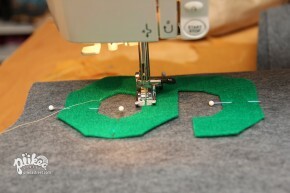 Use a straight stitch to sew the numbers on. Try to sew about 1/8” from the numbers’ edges. 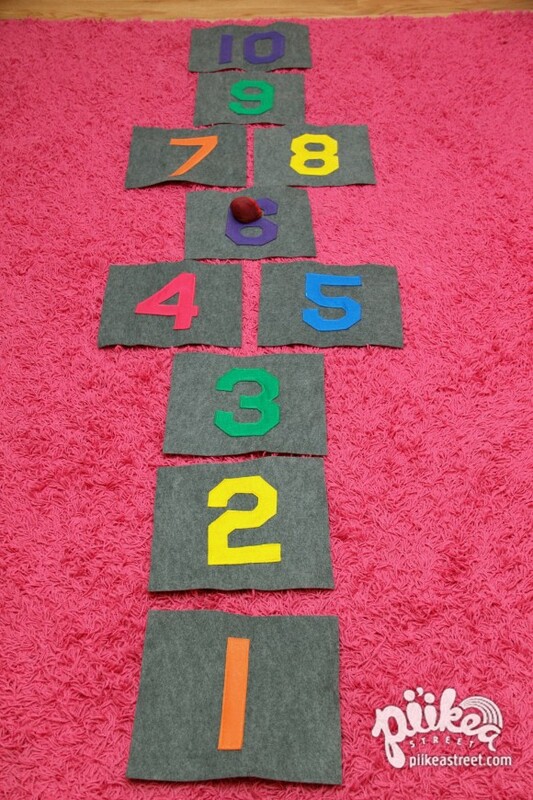 Lay out your hopscotch tiles on your carpet. If you have hardwood floors, be sure to set the tiles on a non-slip surface like a yoga mat. You’ll need something to be your marker like a little bean bag. If you don’t have one, put a few tablespoons of dried beans or rice into a clean sock. Tie up the end with string or a rubber band. This is definitely a great way to keep your kids active when you’re stuck indoors. The tiles can be used for all sorts of games too. For my 3-year old, I setup the tiles in a circle and have him recite the numbers. I also ask him to start from 10 and work his way backwards. This way, he’s not just saying the numbers from memory but actually deciphering the symbol. Of course, the classic game of hopscotch is fun too! Have a hoppin’ good time! p.s. We linked up this week’s crafts at the Kid’s Co-Op Link Up!